Suicide Hooks: These are actually called “Surecatch TEC-COAT Beak” but are the same pattern that are constantly referred to as “Suicide Hooks” by Rex Hunt and various other Aussie and New Zealand anglers in the Discovery Channel programs. We have extensively tested these both on our own fish over here and on recent “research and development” trips to Cuba. These are perfect for live baiting or hanging big chunks of fish on. We have also used them very successfully with live swimmer crabs for Permit so you will obviously have no problem with our crabs for Bass. In fact as an all round hook this pattern takes some beating. These are slightly offset with a cutting point, the short shank and the turned back eye make them ideally suited to the Domhoff knot which gives you a straight pull without crushing the mono / fluorocarbon and therefore greater knot strength. 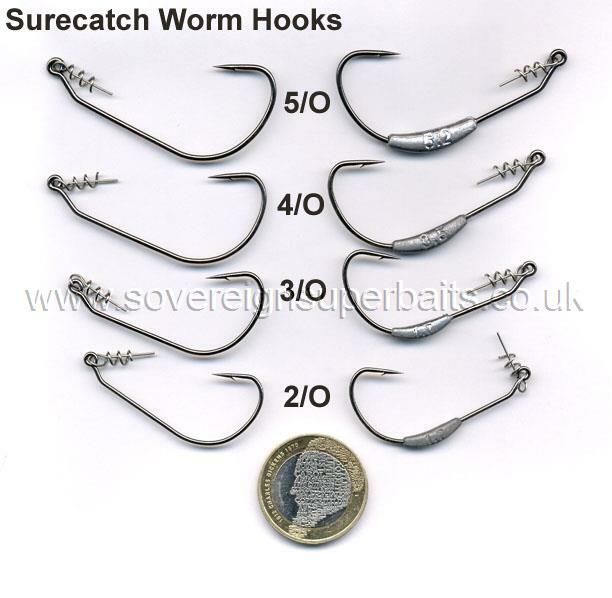 Sovereign Mullet Hooks: We discovered these while fishing in Hungary in 2005 where they are used to great effect to catch small pasty-sized Carp. It has taken us all this time to source and test them in any quantity and to have them tied on fluorocarbon. During our testing we discovered that the glint from either the red or the gold hooks actually improved the bite ratio over plain bronze hooks. The coil spring on the shank retains a small amount of bread, even once the mullet have removed the rest which generally makes them return for the last morsel and therefore get hooked. These have certainly improved our hookup rate by around 5 fold. 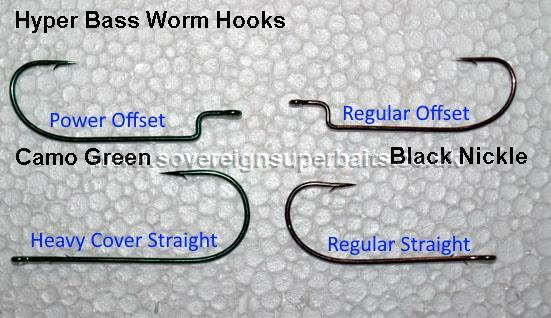 Weedless Hooks: Below are a selection of weedless hooks. The crank necked O’Shaugnessy and Rig n’ worm hooks are for Texas rigging jelly worms and other soft baits. The weed guarded hooks are the same as found in the Felmlee frog and other US weedless baits. The term “weedless” applies to hard stemmed weed such as rushes, lily’s, water cabbage etc. Catfish / Tarpon Hooks (Maruto Eagle Wave), 5Pack. Maruto Eagle Wave Catfish / Tarpon Hooks: These hooks are the first choice of Ebro Cat hunters. VMC Barbarian Jighooks: Arguably the world’s strongest hook. We use these hooks to manufacture our own jigheads. They are not cheap but they will never let you down, suitable for the biggest fish. Jellyworm Hooks: High carbon content, wide gape Aberdeen pattern, partially forged, fine wire but immensely strong micro-barb. Suitable for use with Peeler crabs, livebaits and jellyworms. These hooks are perfect for catch and release. Surecatch Worm Hooks: These hooks get called all sorts of things around the world; some people call them hitchhikers, some call them screwin jigs or screwin hooks. However you refer to them these are a brilliant idea first brought to our attention in 2011 by the guys from Reaction Strike. The hooks on offer here are made for Surecatch in Japan. We have them in various weighted forms and unweighted forms in 4 sizes and we can even make you up a pack of one of each size so you can try them out to see if you get on with them. The screwin part / hitchhiker is 316 stainless and these particular Japanese hooks are certainly the thinnest and claim to be the sharpest on the market. The weightless hooks can of course be used in combination with our snapon jigheads, drilled bullet jigheads and spiral leads, all of which can be fitted at various distances in front of the hook to impart different actions. You can fish just about anything on these hooks, be it a jellyworm, a shad, a frog, a muppet or even fresh bait. You can screw the lock / hitchhiker into a piece of squid, cuttle or even into a small dead fishes skull and anything you mount on these hooks will fish weedless once properly mounted, see mounting instructions below. A number of you have asked how to use the Hitchhiker hooks so we have made a few pictures of the process which you will hopefully find informative. Firstly screw the Hitchhiker part into the nose of your chosen soft bait and finish up with the hook facing down as in Picture 1. While in this position mark the underside of the bend of the hook with a permanent felt pen. We would reccommend either a Sharpie or a Bic Permanent, both are alcohol based and will actually adhere to the soft bait so they can be seen. Swing the hook through 90 degrees as in Picture 2, place in the right position so that the barb would sit just along the back of your chosen soft bait then press down hard. 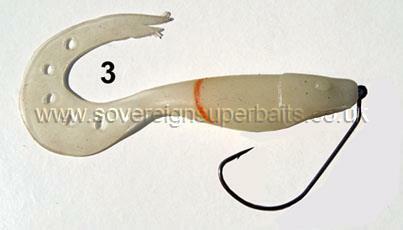 This will leave a perfect mark on the side of the soft bait as in Picture 3 showing the ideal path for the hook. Take the shank and the start of the bend between thumb and finger of one hand and thread the soft bait round the hook following as closely as possible the felt pen mark. With a little bit of practise this procedure will get easier and easier and eventually you will find you can thread these on without the use of a felt pen. When fully rigged put one drop, not more, of Loctite superglue or Superglue 3 on the nose of the soft bait which will help to support the rig. These come ten in a packet approximately 2cm long and can be used to make just about any hook into a hitchhiker hook for weedless / LRF fishing with soft baits. You can see in the picture below we have rigged up a number of hooks to show how useful these are. They are ideally suited to crank necked hooks but with the edition of a couple of split rings as you can see from the picture below you can setup anything from a texas rigging hook to a plain old jellyworm hook. These are an absolute must for your bits and rigs box. Duel "Hyper Bass" worm hooks are in a league of their own. 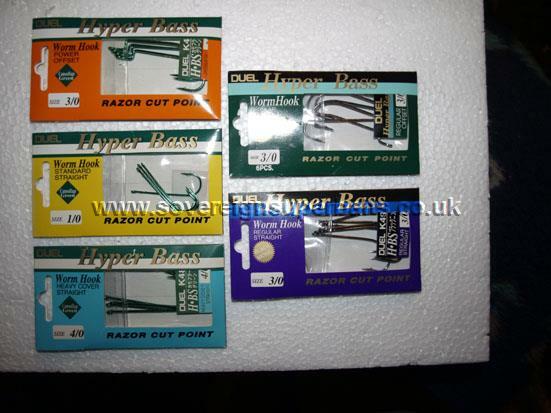 Super strong for the wire thickness, micro barbed for catch & release with the infamous Razor Cutpoint. Available in black nickel or camouflage green, two patterns, five sizes & two colours. Theses hooks were designed specifically for the modern bass angler, with catch & release in mind. The micro barb is just big enough to keep hold of your catch without unduly damaging your fishes mouth. Likewise the shank slices/barbs are just big enough to stop your chosen soft plastic or live rag worm from sliding round the bend & masking the point. This is true 21st century hook technology, made from high carbon steel, they will hold the point longer then most of the competition & can of course be re-honed to perfection, with a couple of strokes of your hook file/stone.